Haider al-Abadi is much more optimistic than most American military assessments of ISIS’s staying power in the country. The prime minister of Iraq said Tuesday he believes remaining Islamic State forces will be removed from the country within three months. Last remnants of ISIS are being driven out by American-led forces in Mosul – their last stronghold. 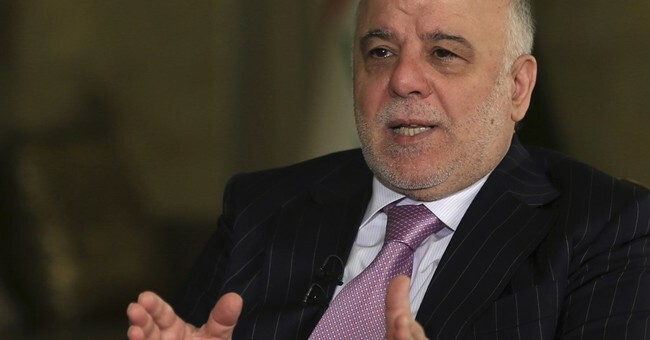 “The Americans were very pessimistic,” al-Abadi stated on Tuesday. “They used to talk about a really long period, but the remarkable successes achieved by our brave and heroic fighters reduced that. I foresee that in Iraq it will take three months." His assessment goes against that of Lt. Gen. Stephen Townsend. In an interview released Monday, General Townsend estimated the time to fully eradicate ISIS forces from Iraq and Syria to be around two years. The battle to retake Mosul began in October. While the fight has been mostly successful – it has also been slow. Iraqi forces have crept within the city limits, but still have no control over the ISIS-held area of Western Mosul. They want to avoid as many casualties as possible. The Mosul fight is being carried on by around 100,000 Iraqi troops, along with the Kurdish Peshmerga and local militia fighters. They are being supported by U.S-coalition airpower. However, after Mosul is taken, there will still be remnants of ISIS forces scattered throughout the country. After his election victory, Donald Trump has been in contact with al-Abadi. The Iraqi prime minister said Trump has promised him more American support in their fight against Islamic extremists forces once he is on office.